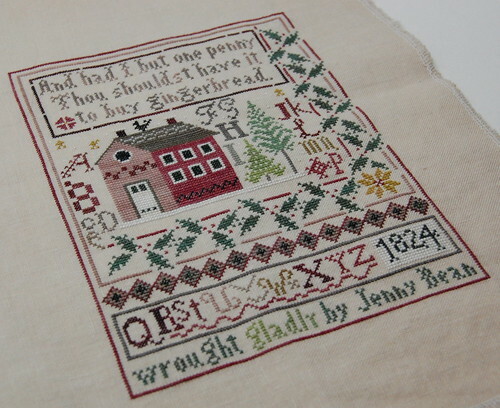 I was looking for some threads yesterday and came across Jenny Bean's Christmas Sampler. I realized I didn't have much left to stitch on it, so I decided to finish it up. 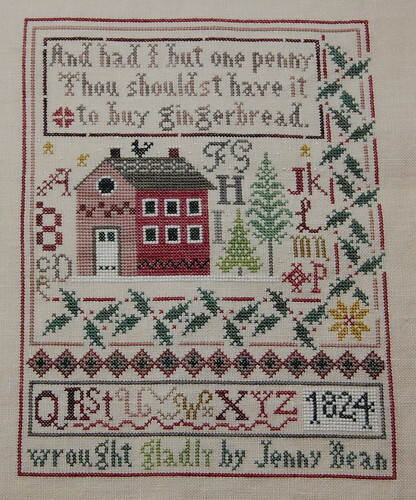 Shakespeare's Peddler "Jenny Bean's Christmas Sampler"
I plan to stitch the BBD houses on one piece of fabric. I think I'm going to go with 40 ct. Pearled Barley. Here are the threads for the first two houses. If you click here you can see Pat Ryan's (R&R Reproductions) start on them (scroll down). Now I have to decide if I'm going to be good and get back to Sarah Woodham or if I'm going to be bad and start on these houses! :) Write soon! Definitely be bad! Jenny Bean is so pretty, and it's such a good photo that I can see all the little snowflakes! Lovely stash. How large a piece of Lakeside did you need for the houses? I love your Jenny Bean Sampler and may have to get that pattern eventually. Great stash too! I really admire that you stitch everything on such a small count fabric! JB Sampler is so pretty. Ooooh, fabulous finish and glorious stash! Be bad. Be very bad. Bad is so good! Love your Jenny Bean! Congrats! Of course you have to be bad... your fans can't wait to see the house stitched on your Pearled Barley linen. oops... I forgot to congratulate you on another awesome finish. Jenny's Christmas sampler looks great. Jenny Bean is lovely, congratulations. WOO HOO!! YGG Nicole! I am so psyched for you. You've had a great month with beautiful finishes and framing. :) I vote for doing whatever makes you the happiest, be it the houses or Sarah. Love the new stash, too! Be bad. I love Jenny Bean. Oh what great new stash!! Wasn't Jenny a fun stitch? I have to get to my local LNS to pick up her new one! what a cute Christmas sampler!! I might have to add that one to my wish list for sure!! Beautiful finish Nicole. That is such a pretty piece. One of these days it will make it to the top of my pile! You got some great stash too. Nothing better than new stash in my book!! Another great finish!! 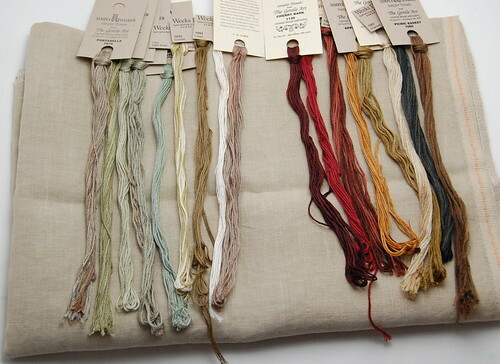 Jenny Bean is such a beautiful sampler!!!! Another lovely finish Nicole! We have such similar tastes in charts - I have 3 of your Nashville charts on the way, including Snow Garden. I'm thinking of using V. Pearled Barley for mine, can't wait to get it! I just dearly love your Christmas Sampler...that is so pretty. I love your Stash that you got too. Your JB Sampler looks wonderful! Nice stash too. Be bad and do what takes your fancy - no rules with needlework. Be bad... 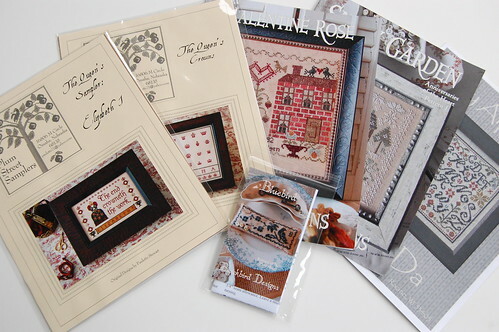 I love those BBD houses and can't wait to see someone stitching them before I cave and get them myself. I think BBD had such great designs at this year's market. Jenny Bean looks great! Congrats on your finish! Great finish! Love your new stash too! Nice finish! And I love your framed pieces. Nicole, you post so often that I get behind in commenting on all you accomplish. Love the JB finish and all of your framed pieces look super. I'm glad to see that you're doing the framing yourself. I'm proud of you. I LOVE that Jenny Bean!!!! Beautiful job, Nicole. 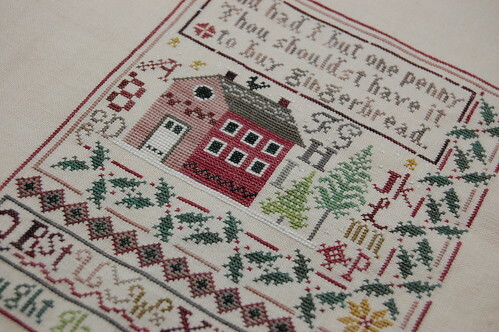 I love Jenny Bean's Christmas Sampler and your stitching is really beautiful! I would be bad if I were you! Stitch things as you want to! I love all the progress you have made lately! I don't know how you do it!! I love your JB finish - I just bought that pattern this past weekend at my LNS. Wow, that's 2 wonderful Christmas finishes you've done already! You're on your way to great decorations this year! OMG; I like each image in this blog better than the last! Your floss tosses can't be beat, Nicole! You first showed of your JBXMas a little after I'd ordered mine, and boy did it light a fire under me! Unfortunately, I'm such a slow-burning wood that I have yet to put needle to fabric! I, too, want that Elizabeth I from PSS and then there's that Snow Garden; I've been thinking how the cover doesn't show it to best advantage, and the linen Pat Ryan's working it on is a real triple-take beauty! Can't wait to see yours; hope to see more of hers, too! Lovely finish! I'm sure you'll have a great frame for it too! I'm jealous of your stash! And you have the newest Plum Street Samplers! Aren't they lovely? Thanks for sharing your finish with us! Congrats on the Jenny Bean finish! And all the framing is great too. Your Jenny bean finish is simply beautiful. Love the photos. Love your finish! I really need to start this one. I loved JB Halloween so much, how can I resist Christmas??? And you got some excellent stash there! Love your choice for the Anniversaries of the Heart. I think I'm going to go with 40ct on all one piece too. Jenny Bea is absolutely gorgeous Nicole! Such a pretty piece. What a pretty finish, love it! And great new stash too. I love the Jenny Bean Christmas piece. Did you use the colors called for? It is so pretty and bright and cheery.